Aspinall Unit Reservoirs – As of April 10, 2019 releases from Crystal Dam are approximately 850 cfs. Uncompahgre Valley Water Users Association has begun diversions through the Gunnison Tunnel and are flows through the tunnel as of April 10, 2019 are 400 cfs. Flows through the Black Canyon are approximately 430 cfs. There is currently about a 20 cfs loss to the Gunnison River between Crystal Dam and the Gunnison Tunnel Diversion. 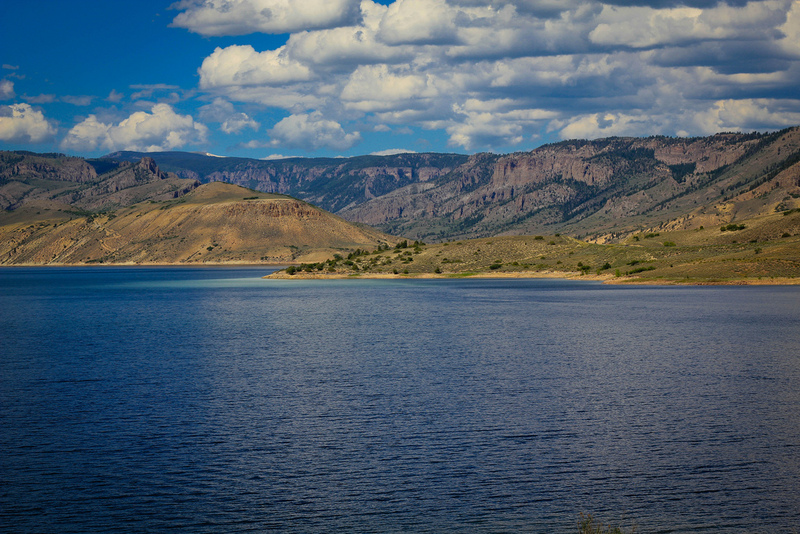 As of April 10, 2019, Blue Mesa Reservoir elevation is 7439.74 feet which corresponds to storage content of 258,294 af (31 percent of capacity). The elevation of Blue Mesa is beginning to rise as inflows due to run off are increasing. The March unregulated inflow to Blue Mesa Reservoir was 27,700 af (77 percent of average). Unregulated Inflows to Blue Mesa for the next three months (April, May and June) are projected to be: 83,000 af (108 percent of average), 270,000 af (122 percent of average) and 420,000 af (161 percent of average), respectively. For water year 2019, the unregulated inflow volume is forecasted to be 1,169,500 af (122 percent of average) with 925,000 af (137 percent of average) of unregulated inflow occurring during the April through July period. The April 24-Month Study is reflective of this new forecast. Current projections indicate Blue Mesa storage will steadily increase as spring runoff begins. Snowpack conditions in the Gunnison River Basin are well above normal at 143 percent of median above the Aspinall Unit. Current projections indicate Blue Mesa will nearly fill by late summer if current inflow forecasts come to fruition. The peak elevation for this water year will occur in or around late July and is projected to be about 7515 feet. The projected end of water year 2019 elevation of Blue Mesa is 7507.5 feet which corresponds to a live storage content of about 724,000 acre-feet (87 percent of full capacity). The Aspinall Unit Working Group is an open public forum for information exchange between Reclamation and the stakeholders of the Aspinall Unit. The public is encouraged to attend and comments on the operations and plans presented by Reclamation at these meetings. Meeting notes from past working Group meetings are posted on the Working Group webpage. For more information on this group and these meetings please contact Erik Knight in the Grand Junction Area Office at (970) 248-0629. The next meeting of the Aspinall Unit Working Group will be held on Tuesday, April 23, 2019 at 1:00 pm at the at the Western Colorado Area Office located at 445 West Gunnison Avenue in Grand Junction, Colorado. To view the most current reservoir elevation, content, inflow and release, click on: Blue Mesa Reservoir Data or Crystal Reservoir Data. To view minutes from the last Aspinall meeting, click on: Meeting Notes.